Clem is slowly rebuilding her life after a house fire destroyed everything. She’s about to start high school with her best friends, Bridge and Ellie, and she’s happy living with her dad in their tiny flat. So when her mum unexpectedly moves back in, Clem feels like there’s no space for her anymore. But then she meets Matt, a funny and rebellious fourteen year old who has family troubles of his own. Clem feels like she can tell him anything... All except her deepest fear. When everything starts to unravel, Clem must decide which secrets to keep and which to share. Clem Timmins is on the verge of starting high school with best friends Bridge and Ellie to share the daunting experience, as they slowly rebuild their lives after the fire destroyed their house. Living in the small, cramped flat has brought Clem and her father closer together, new friend and neighbour Maggie can solve any Clem related crisis with tea and cake and they've begun to rebuild their home with the insurance pay out. For the first time since the fire, things are finally going Clem's way. Until her mother returns from her health retreat and is moving into their rented flat, her two best friends are placed in the same homeroom without Clem and Maggie has a visitor, her troubled nephew Matt has moved in. Clem is feeling overwhelmed and neglected. Starting high school is a nervous and exciting time for Clem until she finds out that she's placed in a homeroom separate to Bridge and Ellie, who will be together. Throughout Clem's high school transition, her two friends begin to leave Clem out of conversations and although unintentionally, Clem understandably is feeling incredibly hurt and isolates herself. I liked Clem's new and tentative friendship with Matt, Maggie's nephew who is also starting a new school as he enters year nine. They were wonderful companions. Matt encourages Clem to take risks, she gains self confidence and finds her voice along their journey while Clem helps Matt connect with Maggie and appreciate his kind, tender Aunt. In The Secrets We Keep, Clem's mother was diagnosed with depression and after the fire that destroyed their home, was able seek treatment. The discussion of mental illness was written with a gentle hand and I really appreciated how Nova Weetman touched upon how Clem's mother's illness effected her relationship, her relationship with her daughter and her approach to her own mental health. It's also a wonderful introduction for younger readers to allow parents to guide discussions about mental wellness. Clem's relationship with her father is lovingly tender, he's also attempting to salvage his marriage while caring for Clem and planning for the new house. Clem still harbours an incredible amount of resentment towards her mother who accidentally started the fire with her meditative candle, panicking and running from their burning home rather than call the emergency services. Her mother was attempting to make an effort but both parents were clearly frustrated with Clem, her refusal to speak, longing for inclusion and reassurance. I enjoyed the complexity of Clem's relationships, the often awkward phase of not quite a teenager but no longer a child. Clem has already experienced so much in her young life and the residual trauma of the fire I feel played a role in her relationships. It was wonderful to experience Clem's growth as a character and young woman finding her way out into the world. Through the tolerance of those around her and positive role models, she was able to learn from her experiences. An important message for the intended audience about learning to compromise and see other perspectives. Clem Timmins is a character that represents the wonderful adventure of growing up and finding your place in the world. The feeling of being lost but eventually making your way back home. Of learning who you are and who you are to others, a daughter, a best friend or your neighbour who loves cake and will share your love of roofing. Nova Weetman has created a character so full of life that she leaps straight from the pages. The duology is so wonderful Charlotte, a quiet coming of age that middle grade and early teens will especially enjoy. I loved this remarkable young lady. It's such a lovely change of pace especially when reading heavy fantasy or intense young adult. Just beautiful. It truly is Aimee and a narrative so many early teens can relate to. Starting high school or even having to move schools is so daunting, I had moved a few times myself at that age and I can still remember how isolating it felt. I would love to see the series in all primary and secondary school libraries. It really does make a difference to know you're not feeling alone. Sounds like a really well written book, and I like the transition of not quite a child/not quite a teen, like you said. It's definitely a bit of a rough moment for most people let alone having everything else the MC has to deal with. I like that the mental illness is handled well. 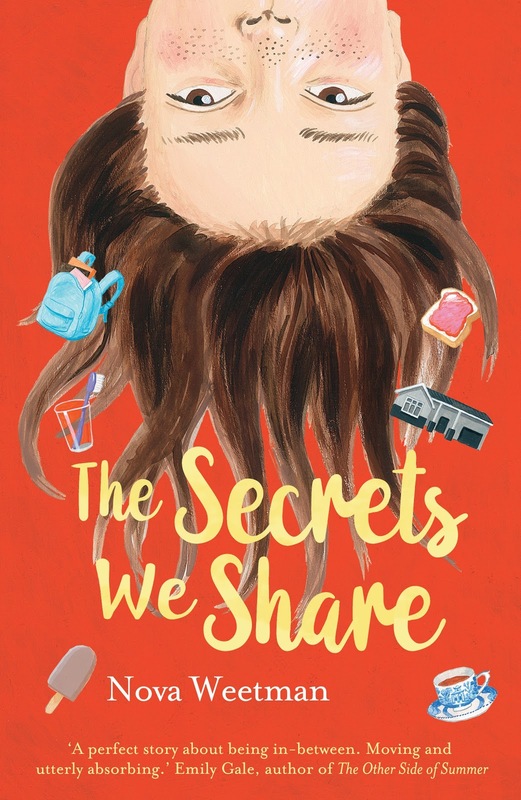 It sounds like it gives younger readers a nice introduction to the topic, especially concerning a parent (or other trusted adult) having mental illness. Thanks for sharing!! It was written so beautifully too Lauren. It's an incredibly difficult age too, you're learning who you are as a person and starting to question the world. One of the loveliest series I've had the privilege of reading. HOW DO YOU FIND THESE GORGEOUS COVERS??? This sounds like yet another fabulous book with wonderful family dynamics and all the awkwardness of growing up. So adorable aren't they and so very Clem. A brilliant read Karen. After reading your review of 'The Secrets We Keep' I went an borrowed both books from the library and read them back to back. Loved Clem! Brilliant little reads. Thank you for bringing them to my attention. Aren't they just gorgeous Sarah, I'm thrilled you enjoyed them both so much as well. Looking forward to reading your reviews. It's a wonderfully genuine portrayal of that in between age Lily, I can remember how anxious it was to start high school, never mind carrying so much on her young shoulders. A truly lovely read. What a complex story this is with the return of her mum. The family dynamic sounds like one I could absolutely get into and enjoy, and also break my heart. There's so much happening at this age for Clem, but it sounds like Weetman has made it all work. She has and it's so lovely Verushka. I loved the exploration of the varied relationship dynamics as well. The desperation of parents, single parenting, reconciling relationships and friendships. This sounds like a deeply moving story! I love books that aren't afraid to dig down to the essence of who we are. Life is a struggle, especially at a young age, and it's not easy to discover the person you want to be. Hell, I'm almost 30 and I still learn new things about myself. So wonderfully worded, we really never stop learning about ourselves and the world around us. It's always changing, we're always adapting. Oh my goodness, that laptop will be the death of me. It's waiting for a courier to pick it up and return it to the manufacturer. Finally.